Welcome everyone to the Lounge!! This area is for anything dripping related as well as rebuildables. My name is Montie. I started vaping in February of this year. I built my first MOD 2 weeks later. About a month in, I saw a YouTube video on building coils. My very first build was on a Nimbus and was dual nano coils using 28Ga Kanthal A1 wire. It ohmed out at .27 I used boiled organic cotton for wicking. I no longer build that low. I prefer to build between .8 and 1.2 ohms. This should be a great forum. I have been wanting to learn about dripping for a very long time but I didn't know where to go to get information on it. Looking forward to this room to get going strong. Welcome to the D&R Lounge midnightron! Pretty much any subject is game here as long as it in someway relates to rebuilding. I hope this grows in popularity also! Just watched a video on how to build a pro tank II atomizer. Waiting for the wire to come in. Had to search everywhere to get organic cotton balls. Finally found them at CVS. Thanks for the greeting. Awesome! I got mine at Walgreen's I think it was an 80 count bag for under 4 dollars...Years worth of cotton for rebuilding and wicking. I am no expert......but may be able to answer some questions....most of what I have learned was from watching Rip Tripper's videos and building it myself afterwards. I have a new favorite dripper that I think most of you would really enjoy. The magma has the best flavor output of any dripper I have ever tried. Great airflow control and a big enough juice well to hold at least 1ml. Performs great with duel coils around .5 up. Probably not a cloud chasers dream but its the best all around dripper I have tried. Help please. Hi all, this is Ron aka (midnightron) I have been vaping for about 2 yrs now. Started out with those sticks which, at the time, were awesome. We have come so far. I am now to the point where I could probably open a store with all the different stuff I have accumulated over the years. During all this time, and especially over the last 6 months or so, I seem to be seeing more and more about dripping. I am extremely interested in learning about dripping but I have no idea what I am doing. Do I need specific mods to do this? Is it safe? Could someone please tell a newbie to dripping how to get started? I mean I know absolutely nothing. I am very active in the other posts here but not in this forum. Any help would be greatly appreciated. I know you rebuild pro tank coils, so (most) drippers will be a cake walk for you. dc99 mentioned the Magma above, and I'll second that. You can get a fasttech clone for less than 15 bucks, it can be run with single or dual coils, it has a large reservoir, and the flavor production is great. I recommend it highly. As to needing a special mod - no, but you might need to tailor your build to the mod. Anything more than an Ego battery can be used. I've used a MVP with a dripper, and those max out at 11 watts. Of course, I used small gauge wire for the coil so that it would heat up properly. If you have more power, you can use thicker wire and get bigger, thicker clouds. I recommend it highly. Hello and thank you very much for your fast response. Unfortunately I purchased the Magma before I saw this post. For the kanger pro I use 32 gauge wire with 4 wraps. I have the itaste mvp 2 and 3 and also a itaste MVP (up to 30W). What gauge wire and how many wraps would you suggest? I would love to get away from the 32 gauge on to something like a 26 - 28. Is that possible? Thank you again. With 30 watts, I would think you could easily make use of 26 and 28 gauge in many configurations. What configuration will satisfy your desires is something you kinda got to figure out for yourself, but my most common build nowadays is 28 gauge wrapped eight or nine times on a 2.5 mm mandrel, cotton wick, running around 16 watts. If I may recommend a website, http://www.steam-engine.org/coil.asp , you can get a good idea how a build will perform by changing the wattage setting in the results column. With that site, you can think of something you might want to try, plug it in, see what it will do, without even having to build it. 36/35 wraps? Really? That seems a little obsurd to me. Am I doing something wrong? What did you have the inner diameter set to? Sounds like you set it to .0126. At inner diameter, they're asking the diameter of the mandrel that you're gonna wrap the coil on. OK, that brings it down to 22/23 wraps. I think this is still very wrong as you suggested 8 or 9 wraps. something else isn't set right also. If you select 28 gauge, target resistance of 1.6 ohms, inner diameter of .1", and leg length of .197, you should get 8.43 wraps. judging from the wire length mentioned, I think maybe you also have dual coil selected. what I was referring to was a single coil setup. That's what steam engine predicts. 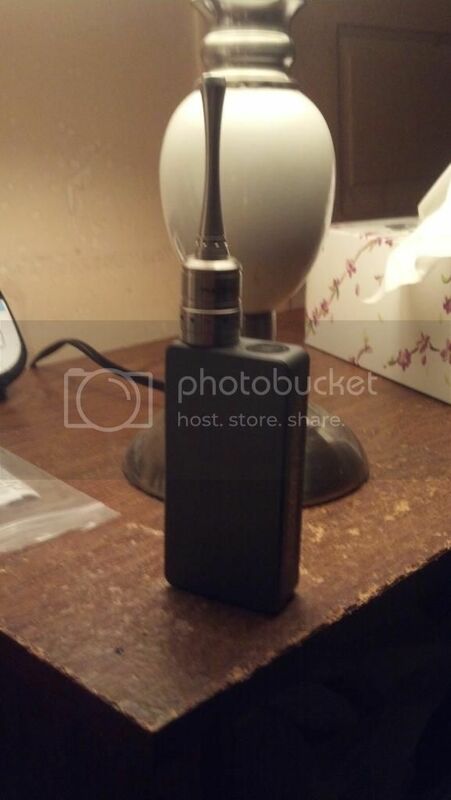 It also says you need about 40 watts to get a "medium warm" vape. sound about right? I really don't particularly pay attention to that part of it. There are way to many variables. This is honestly how I adjust wattage. Start low and turn it up till you like the way it performs. Done, numbers really mean nothing. I do the same dc, I still mainly use .8-1ohm coils with 26-28 gauge nichrome and can vape from 15 watts up to 70 watts on same coil with awesome performance on either side. There are some juices that too much wattage kills flavor or adds a note I dislike. I am on a facebook page with some huge wattage vapers they vape 100 watts and more daily.. I do not see how they do it, I get the shakes and sometimes queasy with 0 nic after chaining 30-40 watts all day everyday lol.. There are some 500 watt vapers out there on 18ga stacked 26650's. I do like the way a good 50-70 watt blast, the warm feels, but it eats my juice too fast, so I keep in the teens and twenties mostly. I diy ejuice 80% and its not the pg/vg, it's the flavors that cost ya, so penny wise vaping keeps me from the high wattage shakes as well..
Those subtanks should come with warning, "hey your gonna get overnic'd at 1mg so watch it, vape wisely"
Normally I am less than 40w. I would venture to say Im under 25 90% of the time. I have found that a lot depends on the juice. Some like the heat and some just taste horrible. I do 3mg in everything and I DIY mine. Since the flavoring is the only PG I have in mine I am usually above 80% VG. For sure you can easily over-do it with high wattages. Even at 20W what I vape with regularly I have to careful about getting overnic'd. I usually alternate with 0mg. There is such a thing as too much vapor.